As the strongest rival to iPad Mini, Samsung Galaxy Note 8.0, touting 8 inch display with resolution 1280*800, absolutely rocks for movie enjoying. It's no surprise many people want to put their favorite DVD movies on the fourth product of Samsung Galaxy Note series. However, the distressing thing is that DVD isn't the format acceptable by the Jelly Bean gadget. Instead, it only recognizes such video formats as MPEG4, H.264, H.263, WMV, DivX (1080p HD video). So if you’d like to play DVD on Galaxy Note 8, the top priority is to rip DVD to Galaxy Note 8 viewable format. To be frank, this can be an easy task with the help of a professional DVD to Galaxy Note 8 ripper. But DVD converter software differs greatly in terms of DVD ripping ability, video quality, speed, easiness, etc. So what will the all-inclusive DVD ripper program look like? 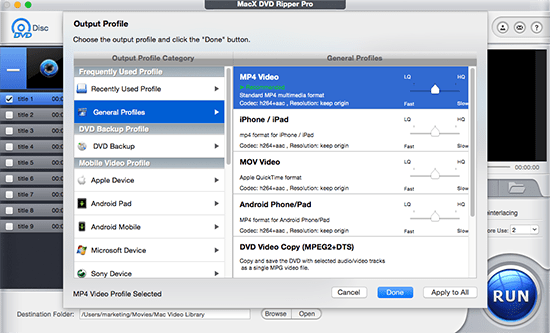 Well, MacX DVD Ripper Pro definitely meets all your demands. I can say without reservation this tool bends over backwards to rip protected DVD to Galaxy Note 8 on Mac in spite of copy protection encrypted on DVD by stumbling over CSS, Region Code, Sony ARccOS, Disney Copy Protection, etc. Its built-in multi-core CPU, high quality engine, as well as Mac-style intuitive interface ensure the most favorable video quality, the fastest speed and the easiest way when you convert DVD to Galaxy Note 8. Below are the simple steps to put and play DVD on Galaxy Note 8 on Mac computer. Download and install this DVD to Samsung Galaxy Note 8 ripper on Mac OS X, click "DVD Disc" button to import DVD. Or you can import this disc by hitting "DVD Path". Infused with 300 output profiles designed for mobile devices, TVs etc. so that users can directly convert DVD to Microsoft Surface, Apple iPhone (include iPhone X/8/7/SE/6s/6), iPad (include iPad mini 4), iPod, Apple TV, Android, HTC, Samsung, PSP, etc, this Mac DVD ripping software enables you to directly rip DVD to Galaxy Note 8 on Mac OS X by simply navigating to "Samsung Galaxy Note (MPEG4)" or "MP4 Video" to rip DVD to MP4 from the drop down box. For better video quality, you can adjust the parameter settings as you like. Generally, the higher the bitrate is, the bigger file size it will be. Click the "RUN" Button to start to rip DVD to Galaxy Note 8 on Mac. For those who want to make the converted video more stylish with editing software, this DVD to Galaxy Note 8 converter is qualified enough to rip DVD to Final Cut Pro, iMovie, etc at fast speed. iOS users need a file transfer tool to sync the copied DVD movie file to iPhone iPad etc. MacX MediaTrans is worth a try as it delivers the fastest speed and a much easier manner. Notice: We only advocates using this best DVD ripper to rip commercial DVDs to Samsung Galaxy Note 8 under the concept of Fair Use and does not encourage any illegal reproduction or distribution of copyrighted content. Please abide by the local DVD copyright law before doing it. How to convert DVD to Android tablet without any problem? This tutorial gives you tips and tricks to rip DVD to Galaxy Note 8, Kindle Fire HD, Google Nexus 7, Samsung Galaxy Tab, HTC Flyer,etc with a professional DVD to android tablet converter.